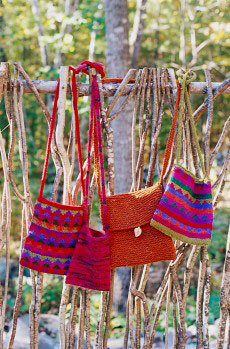 Knit this versatile “everywhere bag” in different sizes to carry almost everything. For this colored triangle-patterned everywhere bag, gather up your colored yarns and knit a striped pattern, breaking into the small repeating triangle motif every few stripes. You also can select a comparable yarn in your favorite eight colors. Using Color A, cast on 39 sts. Starting with a knit row, work the entire color and chart sequence in St st. Rows 1–4: Work in Color F.
Rows 5–8: Work in Color D.
Rows 9–12: Work chart using Color H for background (MC) and Color E for motif (CC). Rows 13–16: Work in Color C.
Rows 17–20: Work in Color G.
Rows 21–24: Work chart using Color F for MC and Color A for CC. Rows 25–28: Work in Color D.
Rows 29–32: Work in Color B. Rows 33–36: Work chart using Color D for MC and Color C for CC. Rows 37–40: Work in Color F.
Rows 41–44: Work in Color B. Rows 45–48: Work chart using Color E for MC and Color H for CC. To finish the piece, work 4 rows in garter stitch in Color D.
Make a second piece the same way. Weave in loose ends and block gently with steam. If you picked up stitches to start the second piece, you need to seam the bag only along the sides, using the mattress stitch. Otherwise, graft or backstitch the bottom edge of the bag together, and then seam the sides. Using Color A, cast on 4 stitches and work in St st for 44 inches or the desired length for the strap. Or work a cord on dpns using the I-cord technique.